In order to provide creative ideas to the participants who attend this seminar, I’d like to share some of the ‘best practices’ that are currently being used by Lions at the club, district, and international levels. If you are willing, please send your best or favorite ways of recognizing people for the tasks they have completed, the quality of their efforts, or the personality they have shown while serving the needs of others to: r.littlefield@ndsu.edu. I will credit those who send their ideas to be shared with the participants at the Forum and will put together a master list for anyone who is interested. Time is short, so any ideas or materials should be sent by August 25th. I’m off to LCI Board Training in Chicago this week. 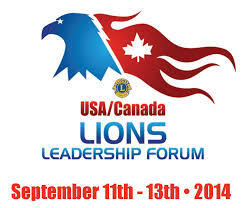 The schedule is full of informative and motivational meetings with LCI staff and Lion leaders. This orientation is designed for board members only in order to build relationships and familiarize the new members with protocol and services available to us as we begin our service, so spouses are not attending. Watch for postings and pictures as our service continues. Kathy and I are honored to be serving with you! Happy for you and happy for your students. This will be a worthwhile class.